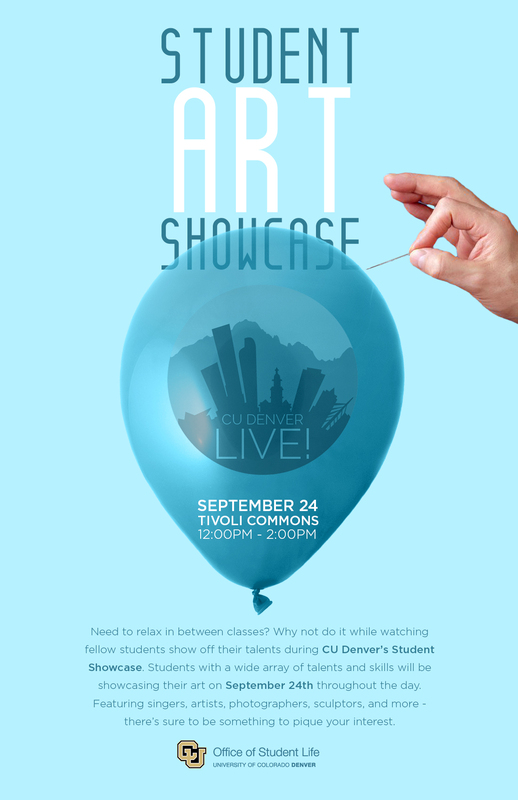 Fall 2014 / Spring 2015 – CU Denver Live! What Is Art? is back! 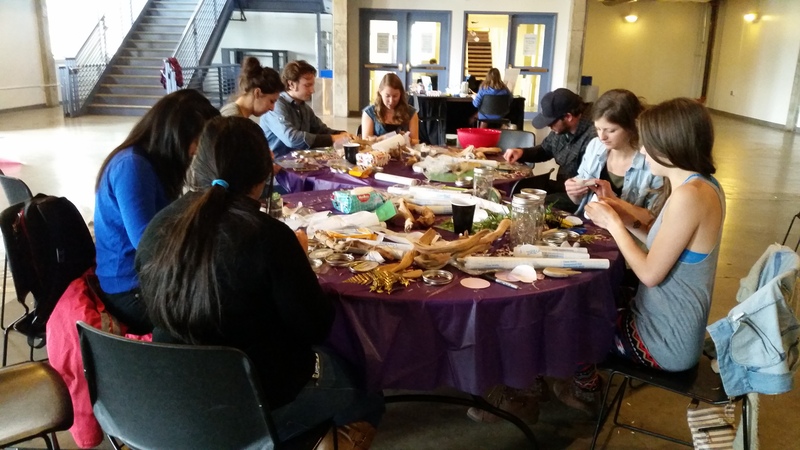 Students kicked off the semester with the second annual student-made art project. Students tested their aim by throwing darts at neon paint filled balloons for a fun, creative release. Students also had the opportunity to win tickets to Lynxapalooza 2014 featuring Matt & Kim. 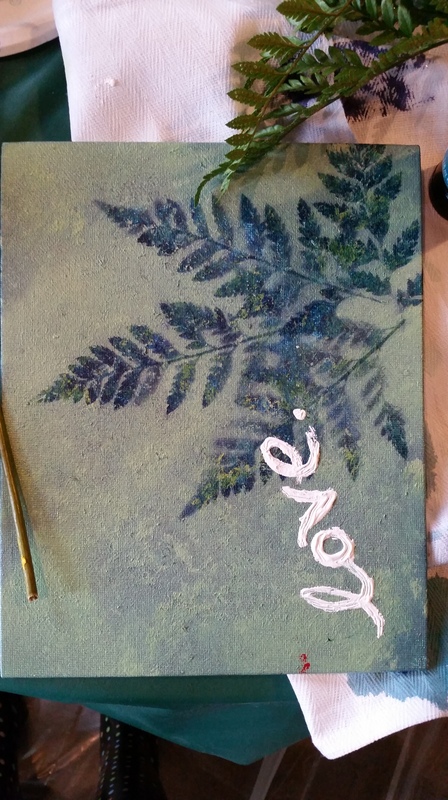 We created a beautiful canvas we can display at various events and on campus. 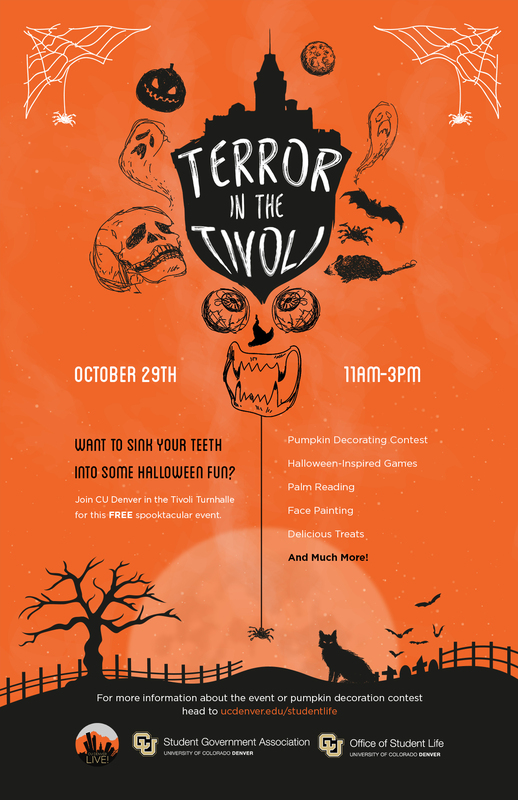 If you missed out on this fun event, drop by next year to test your aim! CU Denver Live! 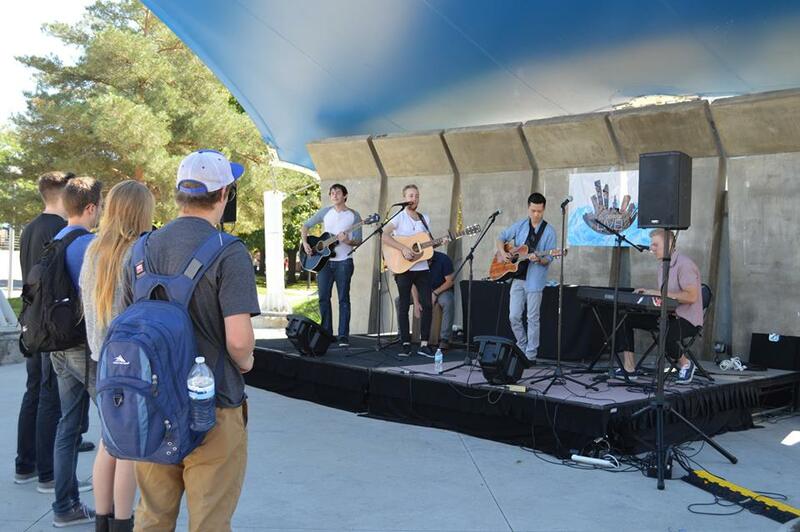 hosted the second annual Lynxapalooza on August 30th to kick off the fall semester. 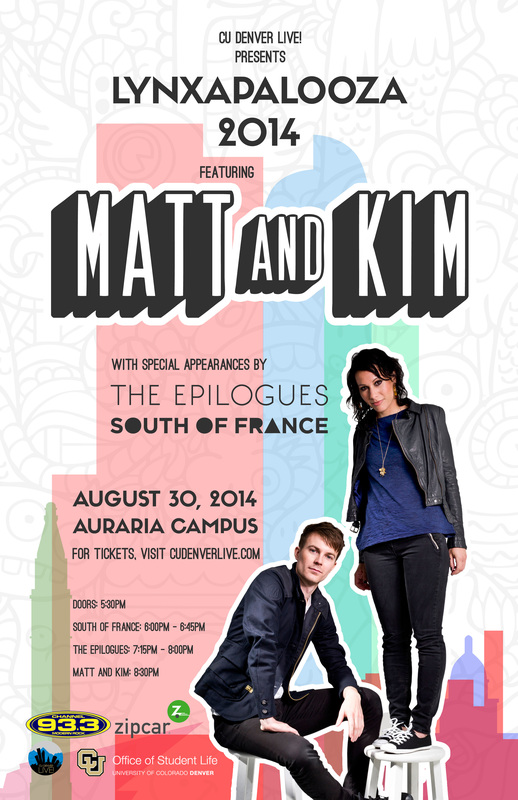 We featured nationally acclaimed artists, Matt and Kim, with opening bands, The Epilogues and South of France. 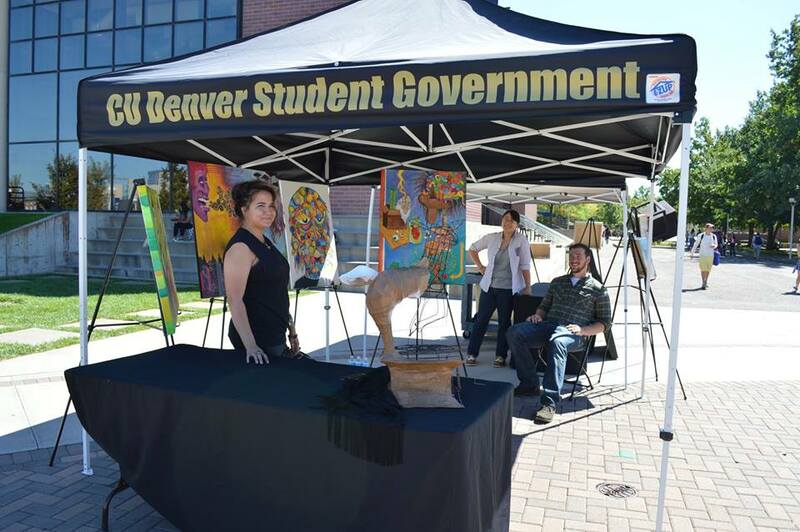 The event also brought in food trucks, CU Denver giveaways, and a photo-booth! Join us for Lynxapalooza 2015 to see what artists and entertainment we bring in next! Please feel free to send us feedback or suggestions regarding future events. 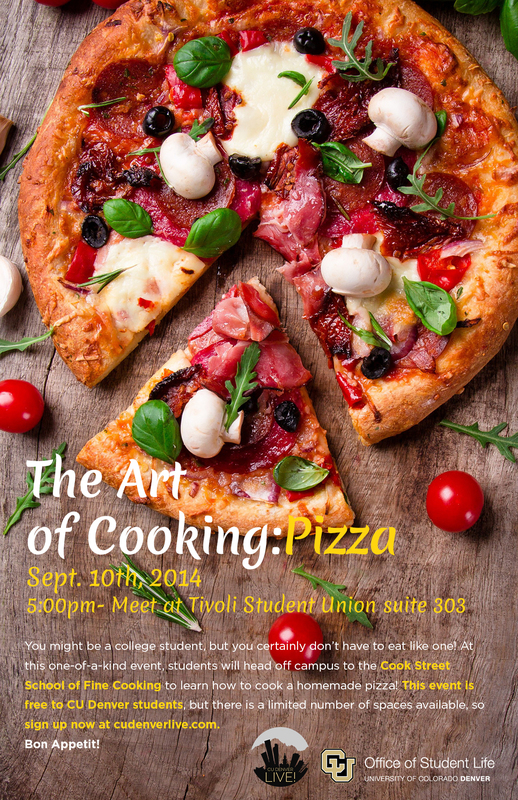 The Art of Cooking was a delicious success. Students met in Tivoli 303 for a chance to win Demi Lovato tickets, and then walked over to Cook St. School where they were greeted by delicious appetizers, drinks, and their very own aprons. Chefs Erin and Adam walked students through salads to desserts, teaching them how to make a grilled salad and two different types of pizza (including a German flammkuchen). Students were then treated to a fruit crisp with berries, cherries, fresh figs, and a homemade peach ice cream. Thanks to the school and all the students who joined us at this annual event! 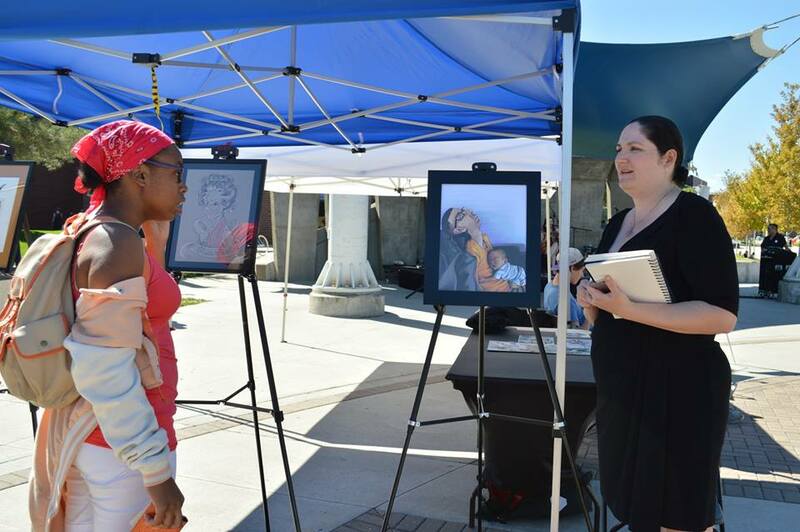 It was a beautiful day for an outdoor art showcase featuring a talented group of musicians and artists. The music ranged from funk horns to rock, and the artists shared pieces of sculpture, paintings, and mixed media. CU Denver Live! was so honored to show off the creativity and talent within our student body. 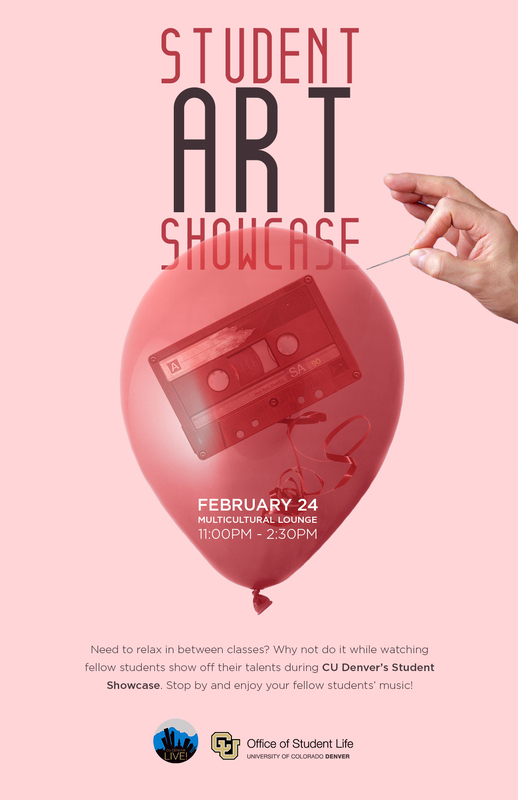 Much thanks to all the artists involved and we hope to see more talent next showcase! CU Denver Live! teamed up with our friends in Events & Activities from Student Life and Student Government to put on a fun Halloween event for students. 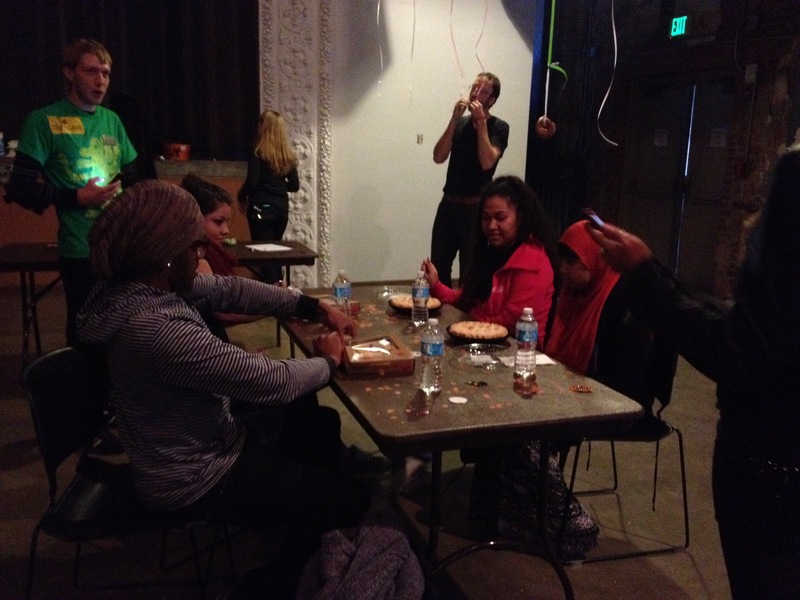 We turned the Tivoli Turnhalle into a spooktacular mansion complete with palm reading, face painting, pie eating contests, pumpkin carving, and more! 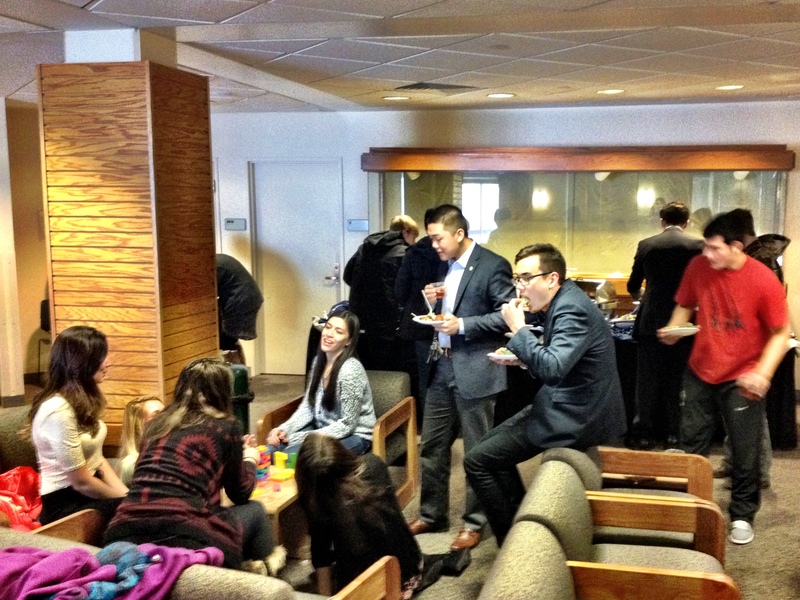 CU students had a great time at the event and Milo even made an appearance. 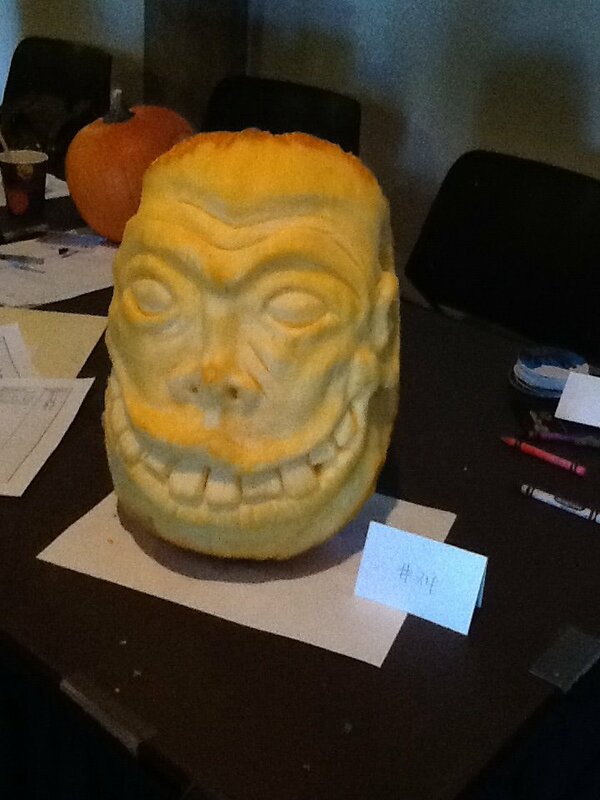 Thanks to all the students who attended and congratulations to the winners of the pumpkin carving contest. CU Denver Live! hosted their second annual Masterpieces and Milkshakes with a new twist. 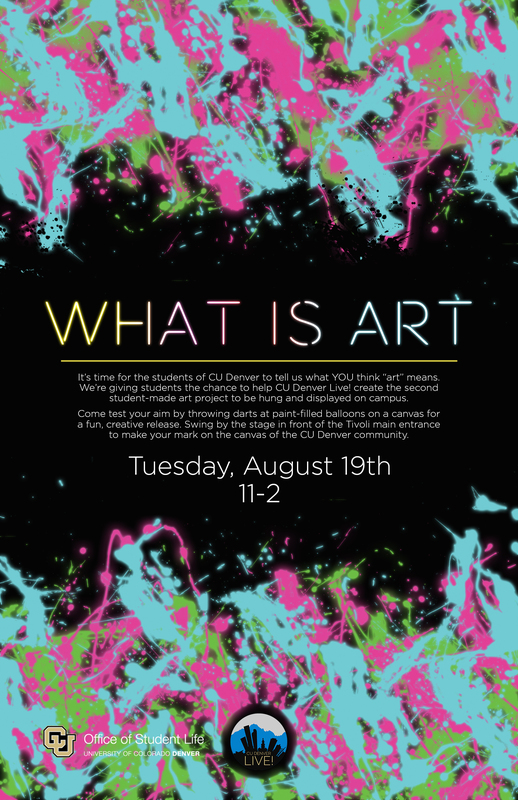 We brought Ceramics in the City to our campus to teach students through painting aspen trees on platters while sipping on milkshakes. 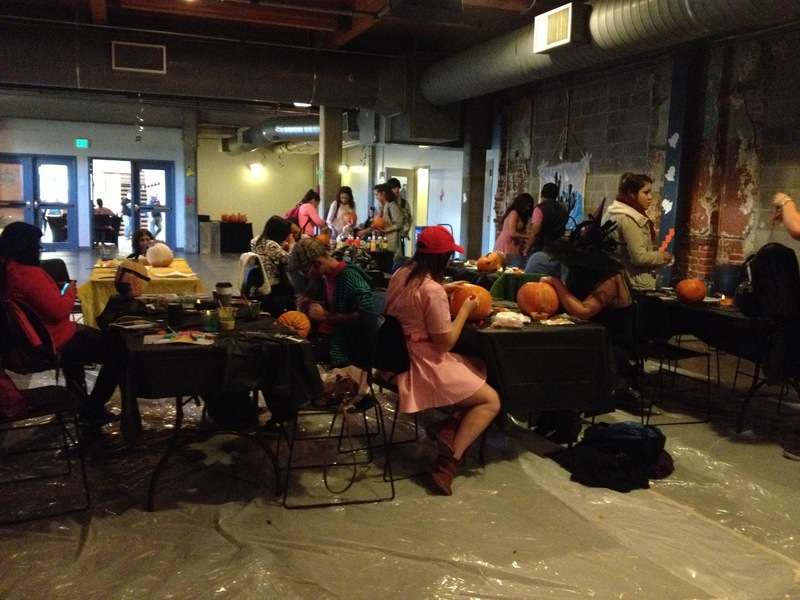 Thanks to all who participated in our fun event! If you did not make it to this CU Denver Live! event, join us next year for another art project and more milkshakes. CU Denver Live! brought students some holiday cheer through discounted tickets to the Denver Center for the Performing Arts performance of How The Grinch Stole Christmas: The Musical. We hope students and their families enjoyed the show as well as their winter break! CU Denver Live! 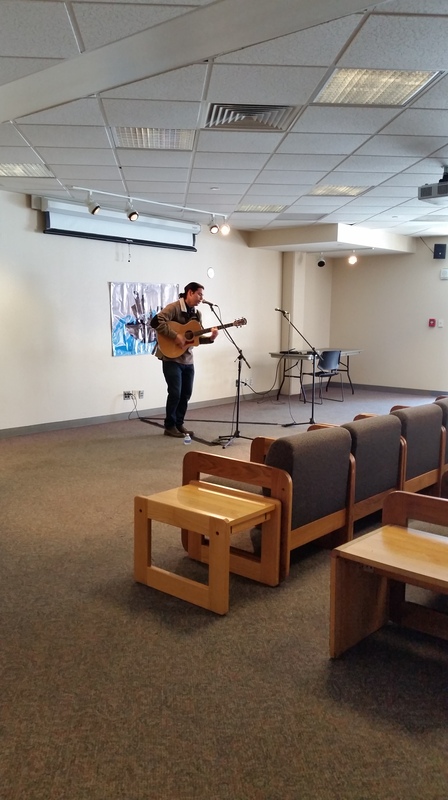 kicked off their first event of the semester through a student music showcase. 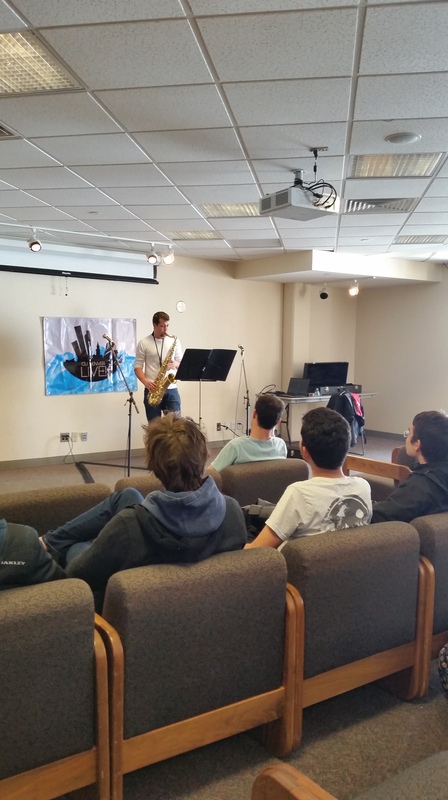 We had some great talent ranging all the way from singer-songwriter to solo saxophone. We are always blown away by the talent in our student body, and look forward to what future showcases bring! 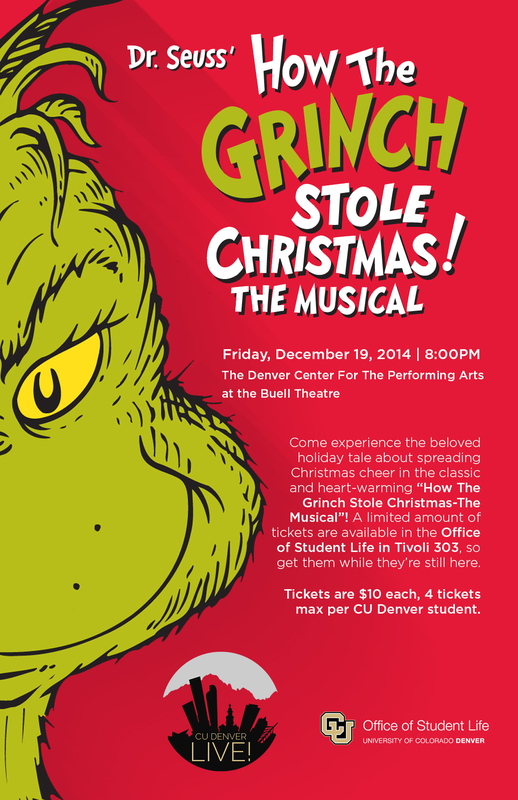 CU Denver Live! 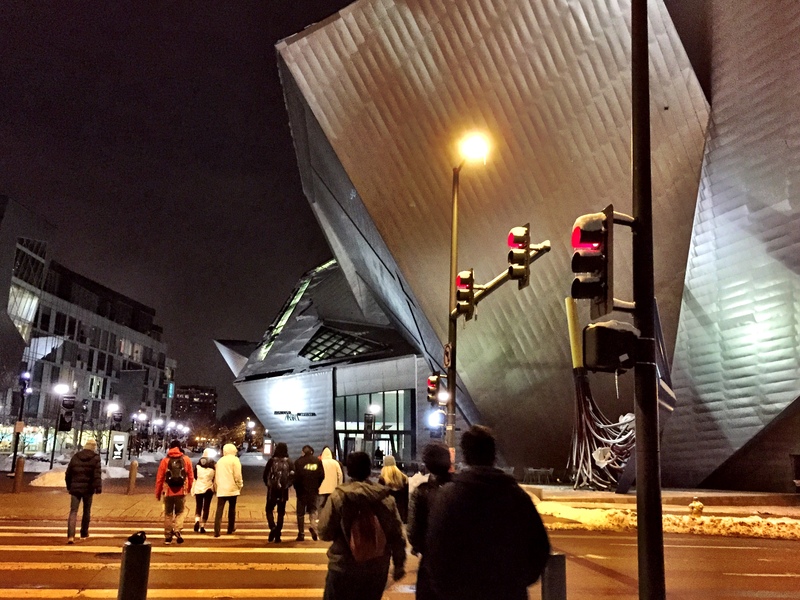 brought students to the Denver Art Museum’s Final Fridays series. This Friday’s theme was entitled “Statement Piece” and students enjoyed participating in everything from jewelry making to 17th century poetry reading. 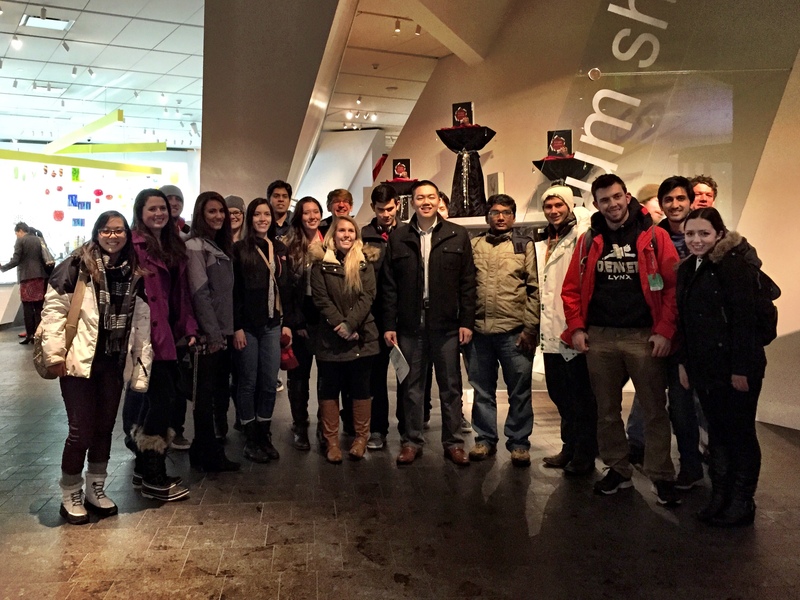 We enjoyed a fun and fancy food reception before the event and then braved the cold to walk to the museum. Thanks so much to all who attended! CU Denver Live! 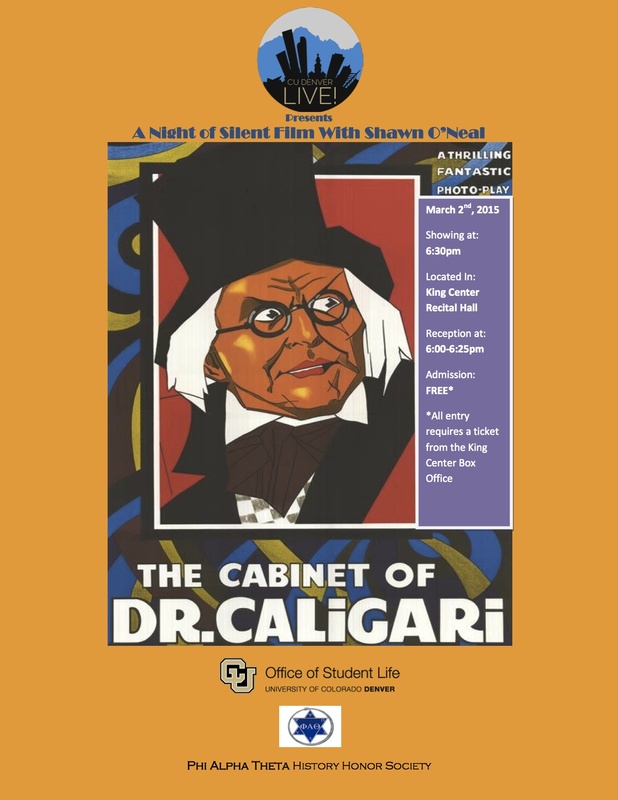 and Phi Alpha Theta teamed up to present the silent film, The Cabinet of Dr. Caligari, featuring music by DJ Sean O’Neal. Hosted by history professor Gabriel Frankenstein, the audience enjoyed a reception before Frankenstein’s introduction to the film and performance by Sean O’Neal. This was an amazing night as O’Neal’s DJ talent captivated the audience with its seamless flow and scary effect on the viewing. CU Denver Live! 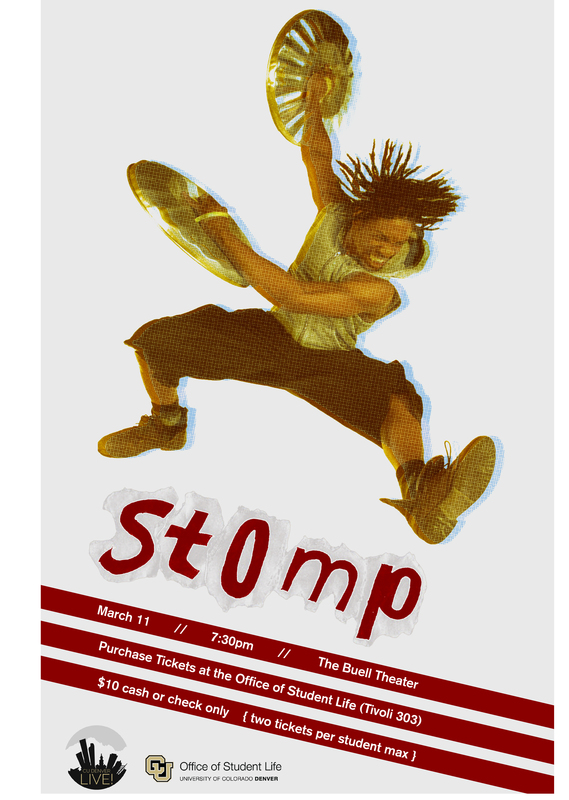 took students to the Buell Theatre at the Denver Center for the Performing Arts to enjoy the performance of STOMP. Watching the creative use of trash cans, brooms, and other unexpected items as percussion was enjoyable and educational for everyone. Students enjoyed delicious food catered by Biscuits and Berries before the show. CU Denver Live! 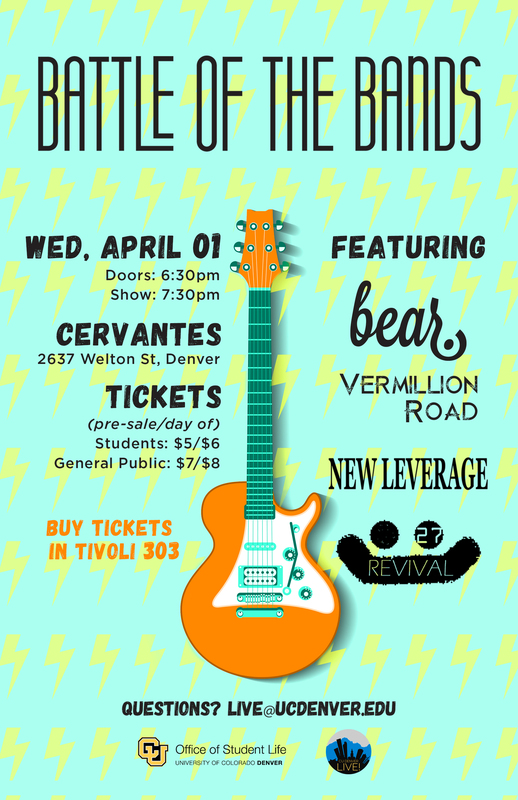 hosted their first Battle of the Bands featuring CU Denver bands bear., Vermilion Road, New Leverage, and Revival. Students were able to have a night of fun and entertainment at Cervantes, and to vote for their favorite band of the night. The winners got the opportunity to open for a national act at Lynxapalooza in 2015. New Leverage won the challenge and opened up for Manchester Orchestra at Lynxapalooza 2015. Keep an eye out for submission next year! 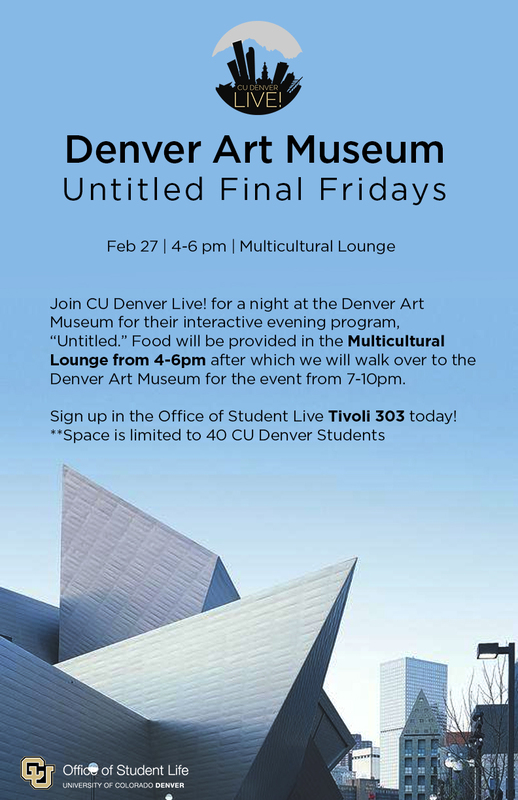 CU Denver Live! 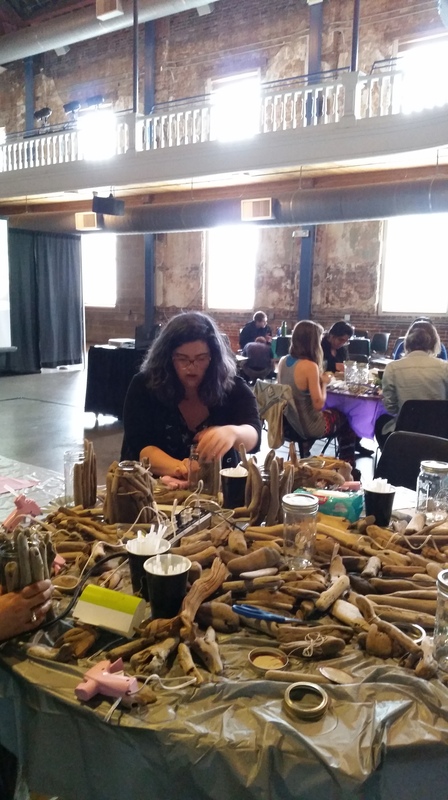 hosted a craft day with nature-themed crafts. 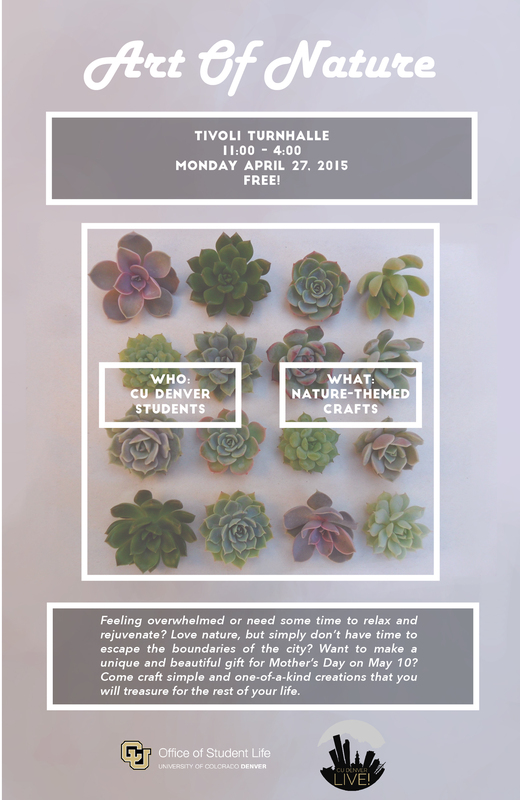 Just around the corner from Mother’s Day, it was a great opportunity for students to make something special for the maternal figures in their lives, or to just de-stress and create before finals began.